PENGARUH KOMPLEKS LINIER ALKYL BENZENE SULFONATE (LAS) DAN KADMIUM (Cd) TERHADAP PENINGKATAN AKUMULASI, ABSORBSI DAN TOKSISITAS KADMIUM (Cd) PADA Cyprinus carpio L.
Al-Ard: Jurnal Teknik Lingkungan is an online and printed Journal published by the Department of Environmental Engineering, Faculty of Science and Technology, Islamic State University Sunan Ampel Surabaya with. The Jurnal published 2 (two) times in a year, September and March. 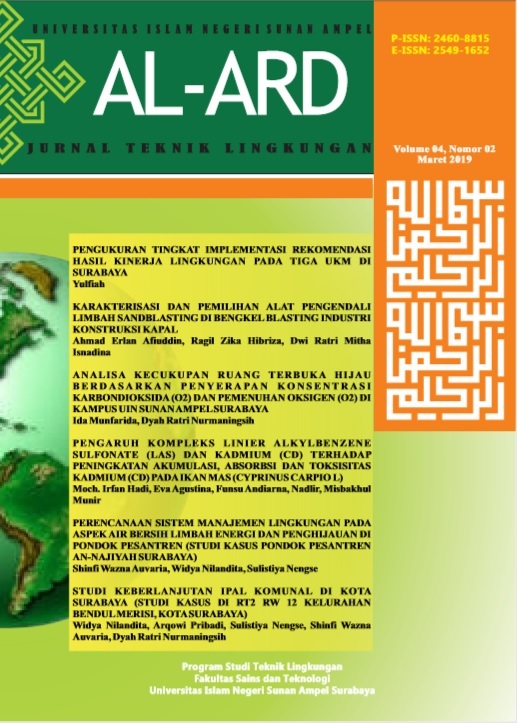 AL-Ard by http://jurnalsaintek.uinsby.ac.id/index.php/alard/index is licensed under a Creative Commons Attribution-ShareAlike 4.0 International License.